Gorgeous 2BR Condo Directly on the Perfect Cozumel Beach!!!!! You will not find a more perfect condo RIGHT on the beach on the island of Cozumel. Most other condos have very limited beach and water access due to the coral formations - but we have miles of white sand. This is THE prime location in the Residencias Reef Condominiums. Our corner unit gives you a huge wrap-around out-door patio with ocean views and is also right next to the pool. ...check out the availability calendar and contact us with any questions and to book your amazing vacation. We look forward to sharing our condo with you. Keywords: 2 bedroom/2 bathroom condo on San Francisco beach, south hotel zone on the Caribbean island of Cozumel. We're a group of 5 friends that set out to own a piece of paradise! We all have kids and families and a love of the island. This condo is truly a 2nd home to us and our families and we put our hearts into making it that. We looked at several properties on Cozumel. But the Residencias, and this condo in particular, were perfect. The quiet beach, the just close enough location to town, closer to the reefs, the wrap-around porch with a constant breeze and direct access to the beach and pool, the beautiful craftsmanship evident throughout the construction - it spoke to all of us. One of the best parts of this location is the choice you have. Dive boats can pick you up easily; the pool & beach are almost empty; but down the beach either direction are numerous activities, people & parties! And you'll be so spoiled by having only 2 steps down to the beach that you'll wonder why you ever stayed somewhere that made you get in an elevator! Both bathrooms have tubs and showers. 6 steps across grass to sand. Plenty of beach chairs in the sun, or under palapas/trees for shade. Rarely very busy! Vonage phone with California number. Stacking set. Not huge but big enough for vacation laundry! 2 comfy sofas, a coffee table stocked with games & Dish and a smart TV with Netflix and Amazon available. Best part is you can see the ocean from any seat! Regular dishwasher, but the maid usually does them! Medium sized unit with freezer. There is often a little coffee left from the last occupant! We always keep filters on hand for everyone. Salt, pepper, various spices are usually available. We leave ketchup and mustard in the fridge too. All major appliances plus toaster, coffee maker/grinder, electric grill. We have dining tables inside that seats 6 and a large table on the patio that can seat 8-10. 40" flat screen in Living room with Dish. It is a smart TV with Netflix & Amazon. The master bedroom has a flatscreen that shows the same Dish channel as L.R. and its own Amazon Fire for streaming. Dish Network, DVD player & HD Flatscreen TV. All U.S. based channels - including the most popular kids channels. There are LOTS of sand toys and blow up toys for the pool or ocean. Wrap-around patio with hammock and eating space. There is a chest full of blow-up floats, fins, and masks. And a large set of sand toys in the back closet! (2) Infinity pool has solar heater in cooler seasons with a jetted whirlpool section. Divers can be picked up at the pier right in front of the adjacent hotel. Wrist bands are available for $2/each from our guard shack. Best location of all the condo units! This unit has everything one would need: bottom level so only a few steps to the grass and just a few more steps and you’re on the sand. It’s as close to the ocean as any of the units. As our party we’re divers, it’s very close to the pier. And we loved that as a corner unit we always got a nice breeze while sitting on the porch. We’ll definitely be booking in the future. This two bedroom condo is directly on the beach and steps from the pool. It is well appointed and very comfortable. We honestly cannot think of a negative. Book this property. You will not regret it. We have stayed in several condos at residencies reef and liked them all. However, this condo was our favorite. The wrap around porch was so relaxing even on rainy days, and ability to walk out on the beach was awesome! We had everything we needed, the beds were comfortable and the layout was perfect for two couples. We will definitely be back! Can’t beat the location of this condo! 5 star location at this complex. Right on the beach and super close to the main pool. Good communication prior to arrival. Kitchenware could use some updating but if you are not planning to cook much during your stay what they have is fine. Would certainly stay here again. The resort was not over crowded at all during the Christmas season. A short walk down the beach to Carlos & Charlie’s and you will appreciate the atmosphere at this resort even more! We couldn't have been happier with this beautiful condo. It had been our 5th time to stay at Residencias Reef and this condo was by far our favorite. 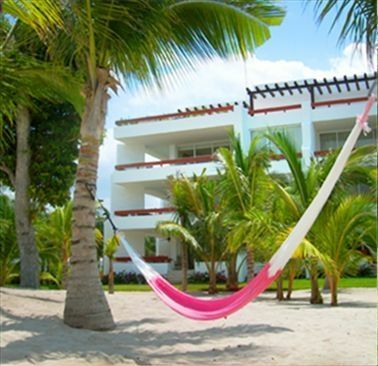 Right on the beach and nicely appointed to make your stay in Cozumel perfect. And it was such a nice touch to arrive and have some essentials like cereal, fruit and milk already waiting for us. This has become our go-to place in Cozumel! So hard to leave! Everything was perfect! Best location on the island! We’ll be back, soon!